Bob Knight also known as "The General" won 902 career NCAA Games while coaching at West Point (1965-71), University of Indiana (1971-2000), and Texas Tech (2001-08). His 902 career wins are second most all-time only behind Coach K's career total at Duke. While coaching at Indiana Knight led his team to three National Titles, eleven Big Ten Conference Championships, he also won NCAA Coach of the Year four times. His career record was 902-371, and he was one of the most innovative coaches as he perfected the motion offense. 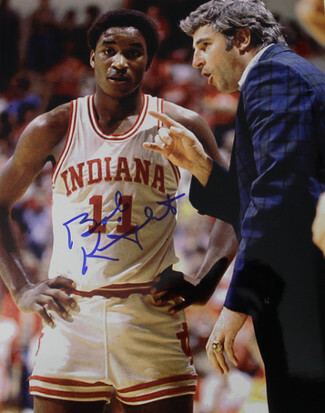 Commemorate "The General" with this hand signed Indiana Hoosiers 8x10 Photo with Isiah Thomas. Steiner Sports Hologram and Certificate of Authenticity.